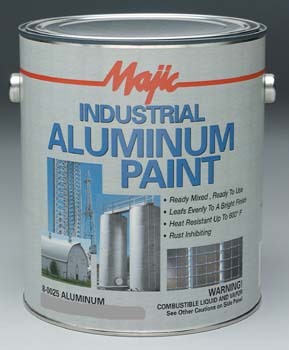 DiscountPaint.net :: MANUFACTURERS :: MAJIC PAINTS :: MAJIC 00251 8-0025 INDUSTRIAL ALUMINUM PAINT SIZE:1 GALLON. MAJIC 00251 8-0025 INDUSTRIAL ALUMINUM PAINT SIZE:1 GALLON. A ready-mixed, ready-to-use aluminum paint formulated with the finest grade leafing aluminum pigments, long wearing oils and synthetic resins. WOOSTER R206 DOO-Z COVER ROLLER COVER SIZE:7" NAP:3/16" PACK:12 PCS. WOOSTER Z1516 TRUSTY SIZE:6" PACK:3 PCS. ALLWAY 06510 CBS25 2-1/2" SOFT GRIP CARBIDE SCRAPER PACK:5 PCS. VARATHANE 12833 211757 GOLDEN PECAN 209 OIL STAIN SIZE:1/2 PINT PACK:4 PCS. MODERN MASTERS ME703-32 CAMEL METALLIC PAINT SIZE:QUART. RUSTOLEUM 1916830 SPRAY BLACK CAMOUFLAGE SPECIALTY SIZE:12 OZ. SPRAY PACK:6 PCS. 3M 2090-1A-BK 1" X 60YD BLUE PAINTERS MASKING TAPE FOR MULTI-SURFACES BULK PACK:36 PCS.